Nothing will ruin a runners day faster than being sidelined by an injury. Add some insult to it if it was the type of injury that could have been prevented with the proper training. Not all training programs are created equal, but some of the best include strength training for runners, specifically to help prevent injuries and improve personal bests with weight training. And while it’s true that running is really the best way to get better at running, you can vastly improve your speed, agility, and power as a runner by incorporating some basic weight training into your workout. 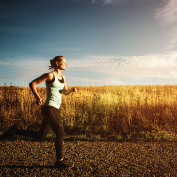 Developing strength in the primary and secondary muscles that support a runner’s fitness passion are just the beginning. A great strength training program that caters specifically to the runner will also develop strength and flexibility in tendons, ligaments, and supporting musculature that will provide stability and optimum length tension relationships between muscle groups. Leg strength training for runners is a good start, but the back, shoulders, and internal core muscles are also working hard when you run, especially during longer runs. Endurance run strength training programs should also include plenty of upper body stretching and weight training to prepare the whole body for rigors of race day. Maybe the single most important strength training exercise to include in your runner’s training program, squats give you a huge advantage when it comes to running. Strengthen your lower back, legs, glutes, shoulders, and challenge your core balance, all with a simple squat exercise. *Stand with your feet pointed forward about hip width apart, holding a dumbbell in each hand. Stretch your arms straight out at shoulder height in front of you with your palms down. Stand sideways to the mirror so you can watch yourself sink down into a squat until your thighs are parallel with the ground, shins bending toward your feet. Keep the neutral curve of your lower back with your shoulders square and strong. Squeeze your glutes and return to standing. If you want to become an elite runner, you have to make sure your glutes are firing on all cylinders. Many runners end up quad dominant without proper glute training. Underactive glutes leave the door wide open to knee injuries and also reduces muscle recruitment available to the runner, limiting performance potential. Fortunately, bridges offer an amazing way to isolate the posterior section of the lower body. For the safety of your knees, and to see speed and endurance gains on the track, definitely do the squats mentioned above, and if you want some extra burning to fire up those glutes, start with 15 or 20 bridges to prime the area. *Lie on the ground with your knees up, and feet resting on the ground hip width apart. Your heels should be just far enough from your glutes that you can barely touch them with the tips of your fingers. Place each hand on either side of your body, palm down, for support. Raise your hips up toward the ceiling until your body forms a straight line from your knees to your shoulders. Hold and contract your buttocks at the top for the count of three, then very slowly return to the ground. It may seem like your legs are doing all the heavy lifting when you run, but the truth is that your core is working just as hard as your legs, if not harder. There is a lot above the waist to hold up and support when you run, and with the impact that running can put on the body, your core is working overtime to keep everything upright and in place. Give your midsection a good planking along with your other run training activities to keep your lower back safe from injury. *Start in a push-up position with your arms straight and your body elevated off the ground in a straight line. Hold this position for 30 seconds, then rest and repeat for a total of three repetitions.